A brain-dead woman kept alive by a hospital in Texas because she was pregnant has been taken off life support. A court had ruled that John Peter Smith Hospital must stop life-saving measures for Marlise Munoz by Monday. 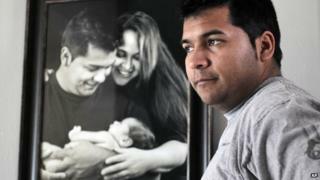 Mrs Munoz, 33, was 14 weeks pregnant when she fell unconscious in November. It is believed she had a blood clot. Her family wanted to let her die, but the hospital had argued it had a legal duty to protect the unborn child. Her life support was turned off at 11:29 local time (17.29 GMT) Sunday, family members told News 8. "May Marlise Munoz finally rest in peace, and her family find the strength to complete what has been an unbearably long and arduous journey," lawyers for the family said in a statement. Mrs Munoz's husband, Erick, filed suit against the hospital on 14 January, arguing that keeping her on life support went against her wishes as a paramedic familiar with end-of-life issues. The family's lawyers also provided medical records revealing that the foetus was "distinctly abnormal" as a result of oxygen deprivation. The hospital in the city of Fort Worth had denied the family's request, citing a Texas law saying life-sustaining treatment cannot be withdrawn from a pregnant patient, regardless of her end-of-life wishes. But on Friday, RH Judge Wallace ruled that Mrs Munoz, who was about 22 weeks pregnant, was legally dead. He ordered her life support to be removed by 17:00 local time (23:00 GMT) on Monday. Mrs Munoz, 33, has remained unconscious since her husband discovered her on the kitchen floor on 26 November while pregnant with the couple's second child. A blood clot has been listed as a possible cause.